^ The Poems of Edgar Allan Poe. Edgar Allan Poe Society of Baltimore (April 27, 2007). Retrieved on 2007-09-20. ^ Digital Gallery for Édouard Manet illustrations - Le corbeau. New York Public Library Digital Gallery. Retrieved on 2007-09-20. ^ Thomas, Dwight and David K. Jackson. The Poe Log: A Documentary Life of Edgar Allan Poe 1809-1849. New York: G. K. Hall & Co., 1987: 635. ISBN 0-7838-1401-1. ^ Thomas, Dwight and David K. Jackson. The Poe Log: A Documentary Life of Edgar Allan Poe 1809-1849. New York: G. K. Hall & Co., 1987: 739. ISBN 0-7838-1401-1. ^ Back in 'Black' (2007) Stephen King and Peter Straub return to the shadows with the delightfully creepy Black House.. EW.com. Retrieved on 2007-04-01. ^ Baltimore Ravens History. Pro Football Hall of Fame. Retrieved on 2006-08-25. Forsythe, Robert. "Poe's 'Nevermore': A Note," as collected in American Literature 7. January, 1936. Ostrom, John Ward. "Edgar A. Poe: His Income as Literary Entrepreneur," collected in Poe Studies Vol. 5, no. 1. June 1982. 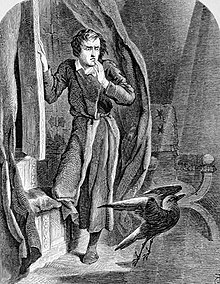 The Poe Decoder - Essay on the symbols, words and composition of "The Raven"
The Raven. With Literary and Historical Commentary by John H. Ingram. London G. Redway. 1885. The Raven illustrated by Édouard Manet, available at Project Gutenberg. 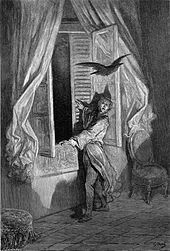 The Raven illustrated by Gustave Doré, available at Project Gutenberg. Audiobook recording with accompanying text of "The Raven".